Deputies in Hillsborough County, Florida, are searching for a male suspect seen in a newly released surveillance video setting fire to a local mosque. The incident occurred on February 27, 2017 at approximately 2:00 a.m. local time at the Islamic Society of New Tampa in Thonotosassa. Hillsborough County Fire Rescue received a call just a few minutes later, around 2:09 a.m., about the fire. Firefighters put out the blaze and no one was hurt, though the building, commonly referred to as the New Tampa Mosque, suffered some property damage, officials said. Deputies from the Hillsborough County Sheriff's Office released the video, she said, in hopes someone will recognize the person in the captured footage and come forward with any leads. Officials from CAIR Florida, the state’s largest Muslim civil liberties and advocacy organization, held a news conference with officials outside the mosque shortly after the February fire took place. Debbie Carter, Public Information Officer with the Hillsborough County Sheriff's Office, told ABC News that the surveillance video of the February incident was released months later because the original footage was of poor quality that required a lot of editing. Hillsborough County deputies continue investigation of February fire at the Islamic Society of New Tampa in Thonotosassa, Fla. 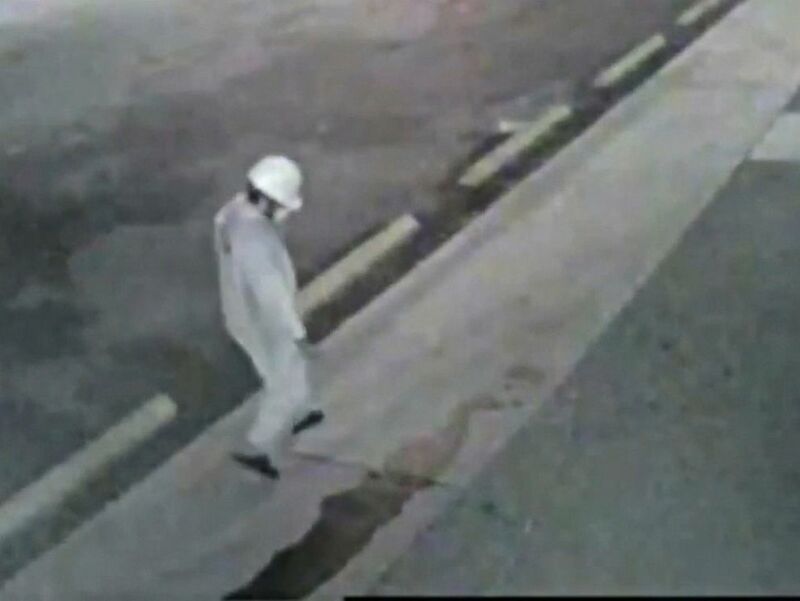 In the video, the male subject is seen entering the property of The Islamic Society of New Tampa while carrying a large container and a rope. The suspect laid the rope as a trailer to the large container and attempted to set fire to the rope with an ignitable liquid accelerant, Hillsborough County Sheriff's Office explained in a statement. After the rope failed to catch fire, the suspect then poured what appeared to be ignitable liquid accelerant on the sidewalk, causing the sidewalk to catch fire. However, the sidewalk fire failed to ignite the large container. The male subject then moved out of the camera's view and ignited the large ignitable liquid accelerant container, which led to damages to the mosque. After igniting the fire, the subject is seen running from the property toward Morris Bridge Road, according to Hillsborough County officials. Laboratory results confirmed that gasoline was present at the scene. Wilfredo Amr Ruiz, an attorney and the communications director for CAIR Florida, called the fire a "hate crime" and an "act of terror." "CAIR-Florida urgently call [sic] all local, state and federal law enforcement agencies to be on top of the investigation of what appears to be a heinous act of terror against the Muslim community,” Ruiz said in a statement. The sheriff's office is asking anyone with information in regards to the suspect to call the Hillsborough County Sheriff’s Office at 813-247-8200 or Crime Stoppers at 1-800-873-TIPS (8477). A $3,000 cash rewards is being offered to anyone who comes forward with leading information.